Jeffrey Weston’s investigative research, insight and masterful composition has successfully transformed the intrigue and deception surrounding, most probably, the largest economic scam perpetrated by any government in the history of man, from a complex web of deceit and subterfuge into a lucid, albeit frightening, mystery solved. 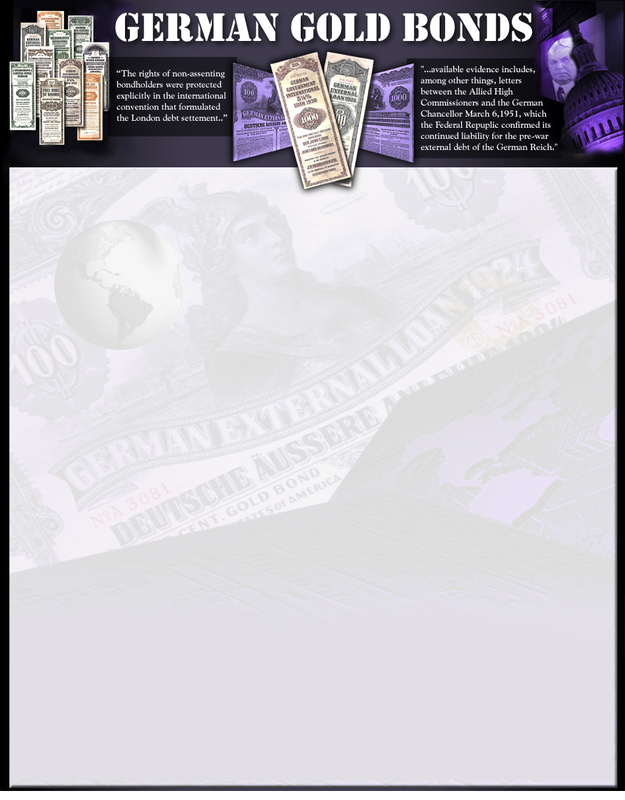 The German Financial Time Bomb clearly details all current obligors to the Pre-World War II Gold Denominated Bonds that were issued by and subsequently defaulted on by the Federal Government of Germany. The book then proposes a series of solutions that could aid in restoring Germany’s integrity in the world’s financial community, at little or no cost in terms of monies expended. The solutions presented would allow Germany to sustain a favorable international credit rating and, at the same time, provide redemption to the hundreds of thousands of bondholders financially impacted by the country's default on its pre-war debts. This book is a must read for anyone concerned about the mushrooming international debt crisis and the desperate need for a restoration of accountability which is prerequisite to the survival of global, democratic and capitalistic economies. Thank you for sharing a copy of "The German Financial Time Bomb" with me. I found it absolutely fascinating and powerful. This story provides an amazing historical perspective of an extremely complex and politically charged financial scandal which has been buried under 80 years of lies and deceit. This glimpse into the inherent conflicts of interest in the worlds financial markets, and the typical non-responsiveness of the U.S. government, is sad indeed. It supports the dim view of capitalism that banks, governments, insurance companies, and most of all people are never to be trusted when money is at stake. I find it particularly interesting that the governments response to this scandal was to create the Securities and Exchange Commission which has completely failed to detect so many financial improprieties and scandals over the next 70 years. Jeffrey Weston's work is highly enlightening. The author succeeds in lifting the fog, which had been previously – and not entirely accidentally – covered debts from German pre-war bonds. Weston provides an enormously knowledgeable account of the reasons why, following World War II, holders of German gold bonds suffered substantial losses. His in-depth research into the whereabouts of the former Reichbank's investment portfolios reveals the exaggerations in the post-war treatment of bondholders. Equally remarkable are Weston's insights into the United States' motives, reasons and intentions regarding the London Debt Agreement, according to which a total loss was never considered acceptable for the bondholders, who, in the fifties, were unwilling to put up with a debasement. The enlightenment Jeffrey Weston's book provides has long been overdue. “A soon to be released book under the title "The German Financial Time Bomb" and subtitle, "A Betrayal of the American Public, A Fantastic Deception, 50 Years of Cover-up and Now a Solution" by the American expert Jeffrey A. Weston deals, in a very detailed way, with the very timely theme of encashment or redemption of the German Goldbonds issued between 1924 and 1930. Obligors of the bonds are the ex German Reich, former German States, Cities, public law institutions and private companies. The book describes 85 different loan issues which have in common the fact that the bonds, issued as American loan contracts subject to U.S. law, are each payable in gold coin of the USA as that was defined at the time of issue. In about 300 pages Weston pulls no punches against the Federal Republic of Germany. Referring to the German Goldbonds he reports of intrigues and fraud perpetrated by Germany. He even refers to Germany's failure to pay on the bonds as the greatest financial swindle of all times in the history of men. He balances his historical account with reports of the mysterious games done by German agencies that try to use malicious deceit, illusions and scare tactics to avoid making payment to the bondholders. The complex matter of the placement of German foreign bonds in the USA in the years of 1924 to 1930, the default of the German debtors from 1933 and the London Debt Accord of 1953 are dealt with in the first two chapters which are documented and commentated from the American viewpoint. Then chapters 3 to 5 deal with the authenticity, valuation and the statute of limitation of the bonds. Chapter 6 elucidates nine American lawsuits involving German Goldbonds. All of those suits having turned out very badly for the bondholders excepting the two that involved Mr. Weston. Chapter 7 discusses Mr. Weston's proposed solutions and ways to assist Germany to pay off the pre-war Goldbonds to the full satisfaction of the bondholders without expense to Germany. Additionally the book contains 28 exhibits including legal opinions, relevant letters and a listing of the specific 85 different Gold-Dollar German External Loan issues which are the subject of the book. * Under the London Debt Accord the offer of repayment of the German bonds could be accepted or rejected at the bondholders option. Those bondholders who did not accept the offer kept the bonds and the original claim. Weston calls those persons, that did not accept the offer, "Non- Assenting Bondholders". * Referring to the German External Debt from 1924-1930 the Federal Republic of Germany is indeed the legal successor of the ex German Reich. * All non-cancelled German Goldbonds presented for payment today must be repaid, both principal and interest, in U.S. Gold dollars as specified under the American Loan contracts. Since American law applies, the repayment in Gold Dollars can be sought through American courts. If the bonds are valued in terms of gold at today's prices then the value of each bond will be over one million U.S. Dollars. Because many of the potentially responsible obligors of the Gold Bonds currently have huge assets in the USA or do significant amounts of business in the USA, such lawsuits for repayment of the bonds may become, under certain circumstances, very devastating for them. Mr. Weston's solution would allow all bondholders to get paid without any of the obligors being damaged or burdened. * In German courts however the claims represented by the bonds do not appear to be payable or enforceable under German law. Germany has for decades avoided making payment of the bonds because of the "German Validation Law". A law which Mr. Weston claims was never applicable to the "Non-Assenting Bondholders". Furthermore, in 2005, the highest German Court (Bundesgerichtshof) decided, in a very controversial court decision, that the City of Dresden need not repay their Goldbonds of 1925. The Dresden bonds were not part of the 85 described in Mr. Weston's book but it does serve to illustrate Germany's position on such matters.